Teamwork Project Manager is a very handy online teamwork and simple project management web app that allows managers, staff and clients to perform a task together more efficiently. This tool lets you handle the project completely by letting you create task lists, schedule milestones, track time, communicate with the team and other things that you require when trying to execute a project. In phase one you have to enter the name of the company and the timezone is automatically set based on your IP address. In the second phase is you are required to enter the the email address, username & password. In this third phase you have to select the sub domain for accessing the Teamwork Project Manager web app. The name of the company is already filled but you can also enter any name you desire. This is a non email providing service that allows you to choose from the list of domains from where your sub domain can be hosted. The fourth phase only has one one field for referral code. Then on this page you are required to agree to the Terms & Conditions, so they can create a free Teamwork Project Manager account. There are multi tiered subscription plans. Different plans for different budgets! A free plan is also available that boasts all the features like unlimited clients and users except secured login access, custom branding, custom domain etc. You have the choice to choose the payment cycle – monthly or annually – while subscribing. When the sign up process has been completed you are directed to a page from where you can invite users to join the team. This step can also be skipped and invites can be sent later too. After the invitations page you go to the dashboard, which is quite empty at the beginning. Create a new project window has sections for name of the project, description, client and features. New project can be made for a new client or an existing client or only for internal use. The new client can be added from this page. You have the ability to enable/disable features like notes, milestones, tasks, time measurement etc for a project. Once the project has been created you can create tasks for it. To start the task creation process first of all you are required to create a tasklist. A new tasklist can be linked with a an existing milestone. These fresh task can be assigned to many persons with a deadline and an email can be sent to them to notify them. If you want then you can set the tasks to be only visible to people who work on them from the Privacy section. You can create a milestone with one person incharge with a set deadline. You also have the ability to add tasks to a milestone or link the milestone to a list of tasks. you can add Project Milestones to keep everybody on the project informed about key dates and goals. 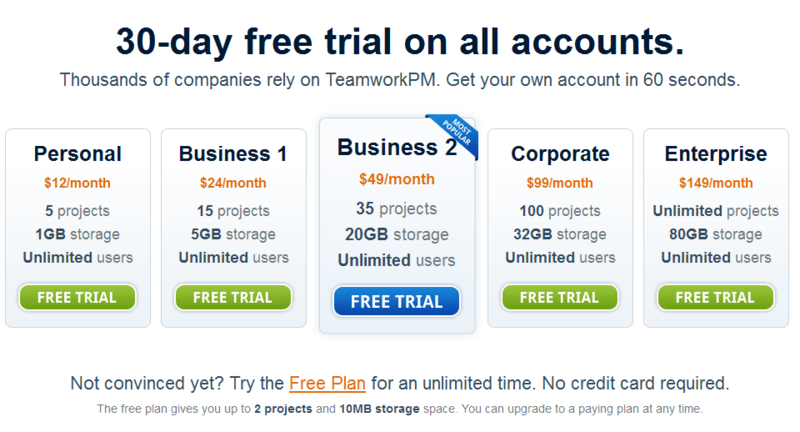 TeamworkPM allows you to take a birds eye view of all your projects and visualize your overall schedule. Teamwork allows you to track the time you spend on every project allowing you to keep projects on-cost and efficiently bill your clients. Share ideas, information, notes, files & more with your team & clients. Help your team stay focused, plan effectively & meet deadlines. 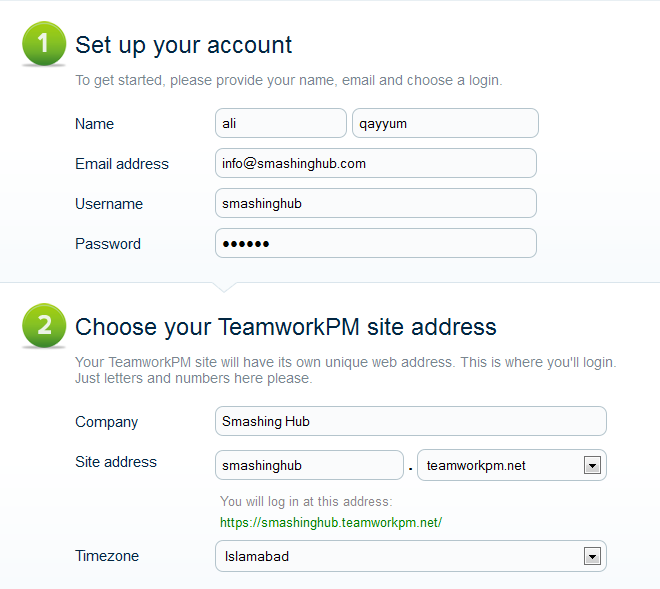 TeamworkPM introduced top feature of Recurring Tasks. This featured help you to arrange weekly backups or make sure annual invoices are not missed, TeamworkPM will now keep you on-track. We feel that almost every business can benefit from this feature. Teamwork Project Manager is a very handy and good tool. After the sign up everything is a breeze. The sign up is quite annoying with many lengthy stages. But overall it is a good tool for Project management. Teamwork PM has a press page here which are working on but it may also contain a few handy links to pics, and other stories. You can check and try handy stuff their! We are looking for your positive response. Thanks for the review but you must have just caught the end of old site as we changed the signup process recently. We heard the same complaints from users so we stream lined the signup form.